As with any complex machine, there are many things that can go wrong with your air conditioner. It may work well for many years and just suddenly quit one day. When this happens, some people want to simply call a company that provides AC repair in Eden and wait patiently for it to be fixed. Other people may want to know a bit more about the problem and the repair. It is wise to learn a little bit about cooling systems and how they work so that you can understand what went wrong, how it was fixed, and how it could possibly be prevented in the future. A little bit of knowledge can go a long way toward making sure that the service you are paying for is reliable. 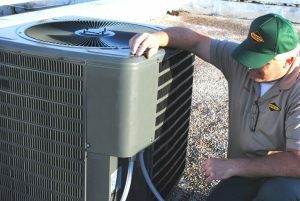 Read on to learn more about repair and AC maintenance in Eden. So just how does your air conditioner take hot, humid outside air and cool it down to make your home comfortable? The warm air inside your home is pulled into the air conditioner through the intake vents. The warm air passes over the evaporator coil which is full of refrigerant. The refrigerant cools the air down and the blower disburses that cool air through the ducts and out through the vents to cool your home. Meanwhile, the warm air is transferred to the condenser coil using refrigerant. A fan blows over the condenser coil to release the warm air outdoors. This cycle repeats until your home reaches the desired temperature that is set on your thermostat. Worn-out blower motor. The blower motor can simply wear out over time and need to be replaced. Refrigerant leaks. If refrigerant levels get low due to leaks or evaporation, repairs and refills may be necessary. Electrical issues. Electrical wiring can corrode due to moisture and connections can wiggle loose due to vibrations. Thermostat problems. If the sensor on your thermostat is off or if the thermostat itself loses power, it can cause your AC to behave erratically. Low air flow. This is often due to dusty filters or blocked ductwork. Condensate drain blockages. A lot of moisture is created when hot, humid air is cooled and needs to be drained. If the condensate drainage tube is blocked it can cause indoor leakage. If any of these or other things go wrong with your air conditioning, it is best to call an HVAC (heating, ventilation, and air conditioning) company for AC repair in Eden. Most problems can be prevented with annual AC maintenance in Eden. Put your air conditioning in good hands with Carolina Fuels. Our expert technicians can repair your system and perform AC maintenance in Eden to keep it running smoothly and efficiently. If you are having problems with your AC or just want a tune-up, call Carolina Fuels today at (336) 623-9741.